Selaginella uncinata is my favorite plant in the garden, this week. No, your eyes aren't deceiving you: Peacock Spike Moss is almost psychedelic in patches. Its striking, iridescent blue-green foliage is just one reason it's my favorite plant this week. Add to that its tolerance of deep shade (read: most of my front yard) and its feathery, floaty foliage that looks perfect in summer, and I have a winner in two pots on my front porch. I had another workhorse, deep-shade-tolerant Carex morrowi, in these pots for years but I got just a little tired of them. Selaginella uncinata was their heir apparent. "Peacock club moss is an extraordinary small foliage plant. Trailing branches are clad in surreal green blue as well as green-a great effect. In winter it takes on tints of maroon and orange. Perfect for shady locations with rich well drained soil that retains moisture. Excellent at the base of large Rhododendrons with ferns and Hosta. Regular water in part shade to shade." "Peacock moss (a prehistoric fern relative) is one of my favorite groundcovers for the woodland garden...I bet I say that to all the selaginellas. The low, spreading habit and the semi-evergreen metallic aquamarine foliage, overlaid on a green background, are sure to make visitors stop to admire this gem. The color is best after the new growth emerges in late spring." Size: Xera says the plant will be about a foot across, but mine are bigger (those pots are a foot across). About 8" high. These pots stayed out all winter - because of our cold periods the plants died right back and were slow to come back in spring. The iridescence takes warmth to develop in summer, too. But once that psychedelic color comes back they are fabulous. The favorite plant meme is hosted by Loree at danger garden. 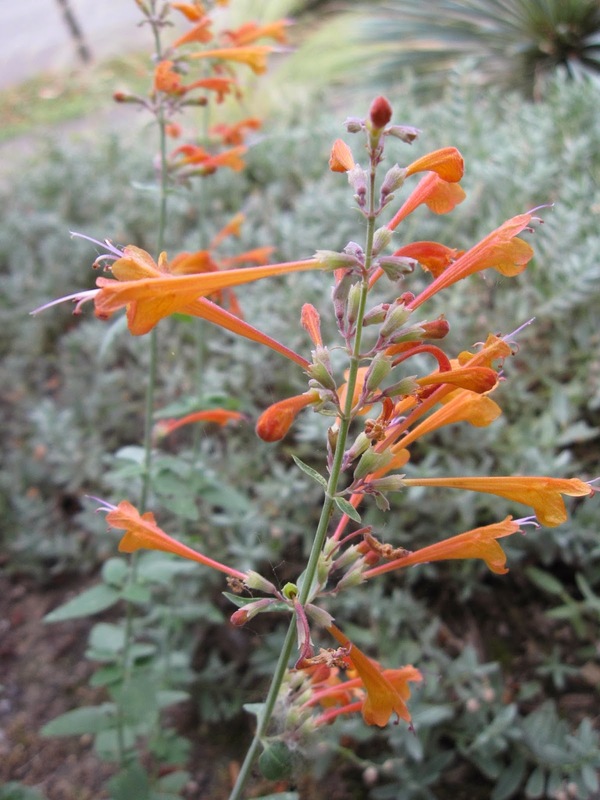 See what favorites are happening in other gardens this week by checking the comments at the link. This past weekend, I have been on a whirlwind tour of garden visits through the 2014 Garden Bloggers Fling. This year the Fling happened in Portland, and I was thrilled to be part of the team planning events. We enjoyed visits to gardens, both private and public, combined with nursery visits and tons of plant talk with over 80 garden-obsessed bloggers. It was great! But my garden has been getting short shrift. Luckily, it seems to be doing all right with some kind attention and watering by the Mulch Man, and has entered high summer's bloom time with exuberance! Let's take a quick tour, with minimal notes to slow us down. I bought this pretty fringed pink as Dianthus noeanus, but its proper name is apparently Dianthus petraeus var. noeanus. I also discovered this year that it has the sweetest smell, completely unlike any Dianthus I've ever smelled before with none of the clove-y quality you might expect. Heaven! Phygelius 'Passionate', with a friend guarding his nectar stash. It's time for the Crocosmia parade. Crocosmia 'Lucifer'. 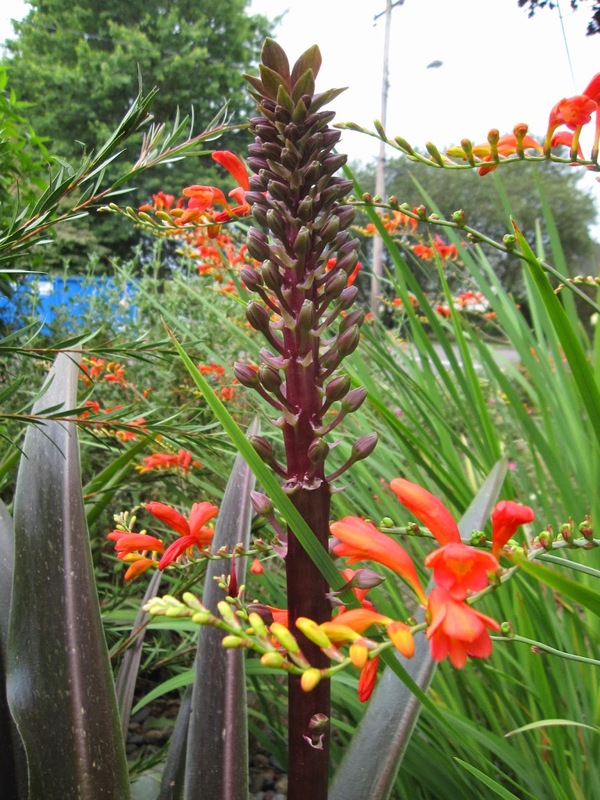 Crocosmia pottsii 'Culzean Pink' with Eucomus comosa 'Sparkling Burgundy'. 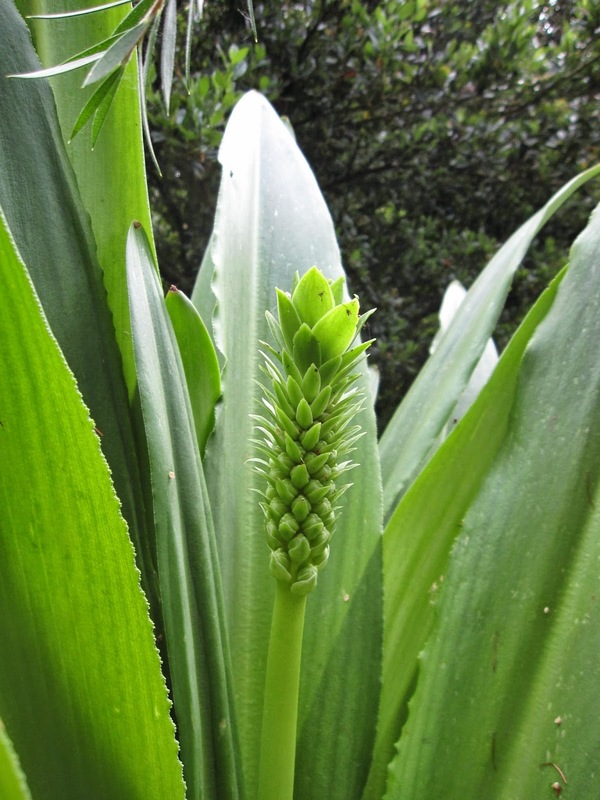 Not quite blooming but coming right along, Eucomus pallidiflora ssp. pole-evansii. 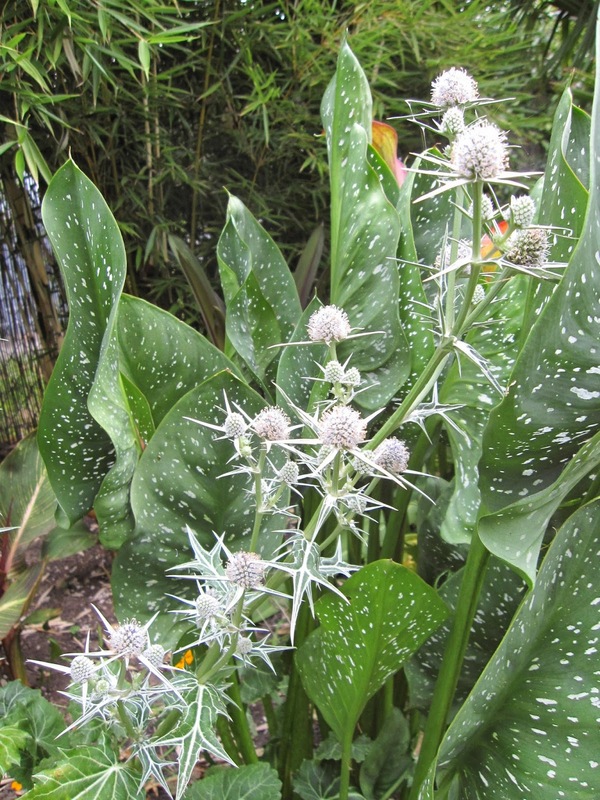 The cross-breeding Eryngium conundrum: I think this is still E. planum 'Jade Frost'. The seemingly ever-blooming Lewisia cotyledon. 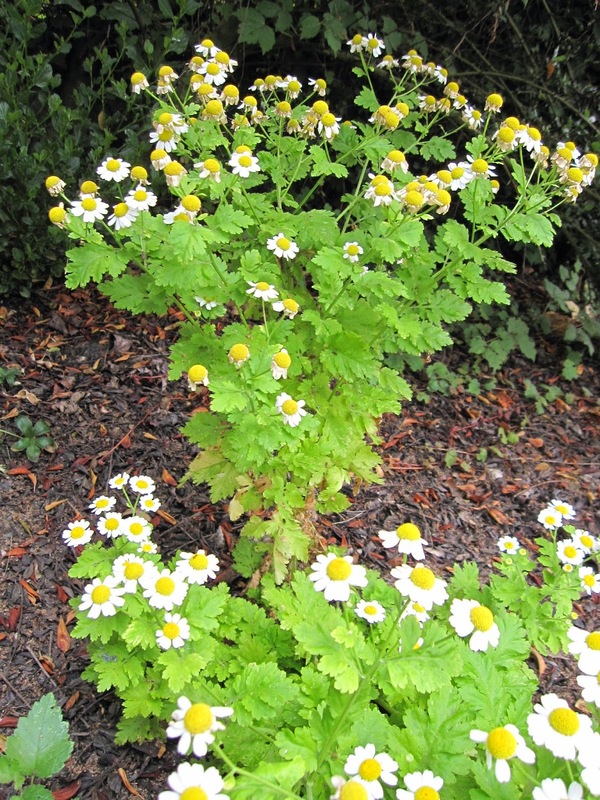 A couple of Feverfew plants light up a dark area. Last, a couple of the Sunflowers I planted to protect a newly-transplanted Podocarpus macrophyllus from summer sun aren't doing that yet, but they are pretty cheerful anyway. Garden Bloggers Bloom Day is hosted by the lovely Carol at May Dreams Gardens. 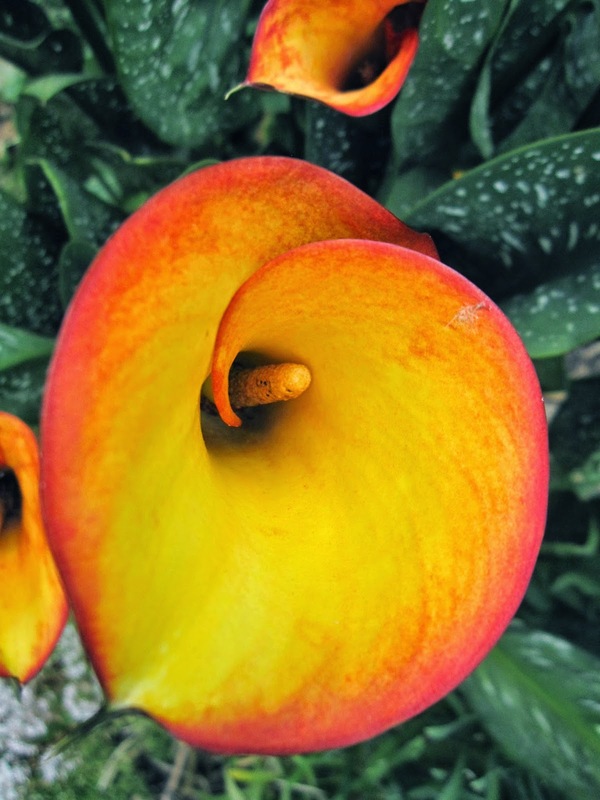 Pop over for a visit to see what's blooming elsewhere around the nation and the world.